Strike Carbon Edition is fully configured with every available option included and will be the first version of Strike to be produced and delivered to customers. The standard Strike has a starting price of $12,998 and is configurable with options and will start production after the Strike Carbon Edition. Designed to shock the industry in every dimension, the all-new Strike is capable of a 150 mile range, 150 mph top speed and 35 minute DC charging. 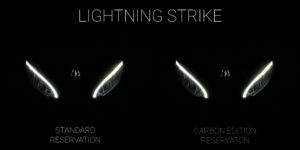 With an ultra competitive starting price of $12,998, Strike offers more design, performance, range and technology than any other electric motorcycle in its segment – without exception. Full Strike product details and unveiling will take place at the official Strike launch in March 2019. Lightning Motorcycles manufactures the highest performing and most advanced electric motorcycles in the world. Our halo product, LS-218, pushes the boundaries of what is possible for an electric superbike by setting land speed records and winning the most competitive motorcycle races in the world.